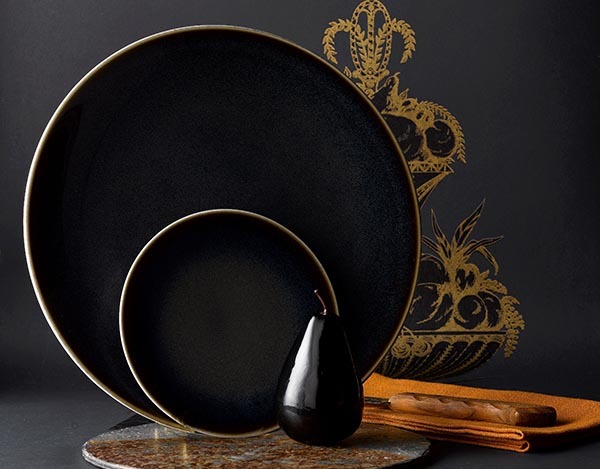 Whether it be for fine dining or, what is known as laid-back luxury for every-day use, Royal Crown Derby have introduced tableware with a warmer palette for a striking and dramatic backdrop when entertaining. You find that chefs have the ever-increasing aim to create unique settings when 'plating up' a dynamic dish, and with the influence of autumnal tableware provides the platform for unique food presentation. Stepping away from the norm in using dark tableware is being seen more frequently in restaurants to be aesthetically different and contemporary stylish which can be re-created at home. Matthew Harrison, Creative Director at Royal Crown Derby comments, "This colour trend combined with texture, such as the industry-leading brushed glaze technique used for the Sketch Charcoal combined with a unique 22ct gold "brush stroke" pattern, inspired by bold abstract artists' sketches reminiscent of an artist's brushstroke, exemplifying the craftsmanship of Royal Crown Derby's skilled artisans and adding opulence to the collection. The pattern represents a spontaneous expression of freedom and the desire for something that is hand-made and individual." View the Sketch Charcoal Collection here. In contrast, the textured brush-glaze of the Studio Glaze Almost Midnight range is a unique technique hand-applied to fine bone china never seen before on such a pure, translucent material. 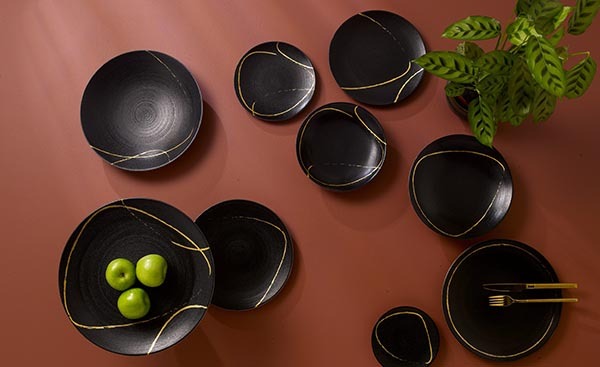 Reactive pigments in combination with the richly coloured glazes create a textured interplay of materials to deliver a tactile and silky sheen on the surface of each tableware piece. It subtly relfects the trends for individuality and hand-made, which allow customers and chefs alike to express their own style by layering, dressing up or mixing and matching with other textures and colours such as Sketch Charcoal and Studio Glaze. View the Studio Glaze Collection here. Extending the technicalities further, the hand-applied sprayed glaze finish introduces the Art Glaze Clouded Smoke tableware collection is an enticing combination on fine bone china, showcasing Royal Crown Derby's innovation and design techniques, making only the very best luxury casual tableware, which is attainable and functional, as well as being high quality and highly desirable. View the Art Glaze Collection here. 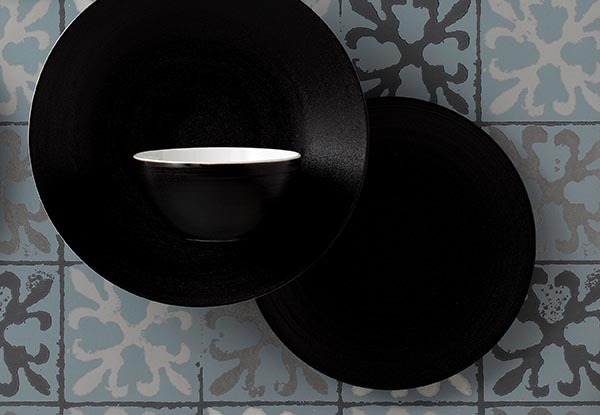 Black tableware is always a classic, but the dark tones are an increasingly important trend for 2018/19, reflecting the desire for luxurious textures, opulent colours, rich natural surfaces and precious hand-crafted pieces. 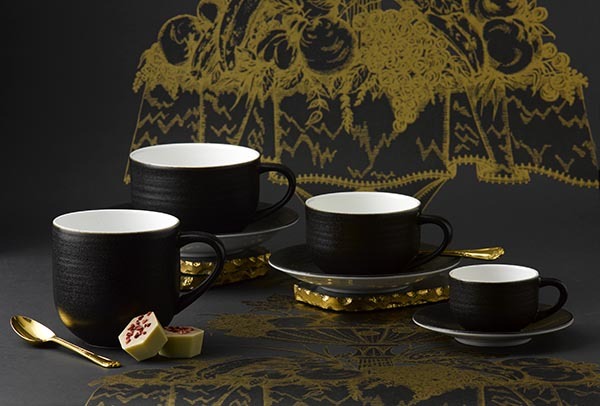 The colour black allows the food to be the centrepiece of a dramatic canvas and the application of this shade to fine bone china combines strength and elegance, which exudes refinement and finesse.